Michelle Dillon couldn’t move out. The 32-year-old southern Seattle resident first started looking for a new apartment when her landlord raised the rent in 2015. It began with a $50 hike and kept climbing. By December 2016, the cost of her modest dwelling had ballooned from from $1,360 to $1,650 a month, a sum she split with her roommate. “I was making about $1,200 a month,” says Dillon, who worked for a nonprofit in the city at the time. “After I paid rent and all my bills, I had about $200 left over for groceries.” This wasn’t sustainable. But as her search for a cheaper apartment commenced, Dillon quickly realized that the cost of moving into a new place was prohibitive. Landlords around Seattle regularly required new tenants to pay an up-front sum that included first and last month’s rent, a hefty security deposit, as well as a whole slate of “administrative” fees. In a city where rents are already astronomically high, Dillon discovered that these “move-in fees” would cost her at least $2000, and often twice that, simply to switch apartments. She couldn’t swing it. So she stayed put and kept getting squeezed. But rental-property owners may have finally pushed too far too fast. After years of jacking prices higher and higher—rents in Seattle have jumped 57 percent in the last six years—landlords are facing a revolt from a young and vibrant tenants’ rights movement in the city. Like similar efforts burbling up in San Francisco, New York, and other rent-burdened towns, Seattle’s tenants’ movement is building power in the streets and translating it into progressive action at City Hall. They are organizing to protect poor and working-class residents, fight fees, combat discrimination, and ultimately enshrine a comprehensive tenants’ bill of rights in the city. And they are doing so, in a number of instances, by pushing policies that have not been tried before. In the last year alone, Seattle’s tenants’ rights movement and its allies in local government, including Sawant and fellow councilmember Lisa Herbold, have scored three ambitious legislative victories. And they’ve done it despite relentless opposition from the real-estate and landlord lobbies. The reforms got rolling last July, when the City Council prohibited rental hikes at housing units that have existing code violations. Then, in August, the council barred landlords from discriminating against tenants who get their income from alternative sources like unemployment insurance or Social Security. At the same time, it required landlords to accept the first qualified tenant who applies for their rental properties. This “first come, first serve” policy, which is meant to curb housing discrimination of all sorts, is likely the first of its kind in the nation. Already, some the city’s landlords, in alliance with the right-wing Pacific Legal Foundation, have sued to stop it. Perhaps the movement’s most momentous achievement, however, came in December, when the council passed an ordinance that forcefully cracks down on move-in fees. Under the ordinance, landlords will now have strict limits on the amount of nonrefundable fees and deposits they can impose on new tenants, people like Michelle Dillon. Property owners will also be required to offer their renters the opportunity to pay move-in fees in increments over several months, rather than all at once. Proponents of the ordinance believe it is a sui generis Seattle reform too, the first of its sort anywhere in the country. While the City Council enshrined these new regulations into law, and got much of the credit for it, the fight against move-in fees started somewhere else. It began with outraged locals like Gina Owens. Owens, a self-described senior citizen who was born and raised in the Emerald City, sits on a variety of resident-led boards that advise the Seattle Housing Authority. In that capacity, she regularly hears from renters and knows what kind of challenges they face. Move-in fees, in particular, are a source of deep discontent. After years of jacking prices higher and higher, landlords are facing a revolt from a vibrant tenants’ rights movement. Such rental practices, she says, are “changing the color” and “changing the class” of Seattle. “Central District, where I live,” she adds, “is traditionally a black community, but in the last five years that has changed and it is still changing.” Owens, disturbed by the state of the city’s housing situation, took her concerns to the Washington Community Action Network, or Washington CAN, a grassroots economic-justice organization with over 40,000 members. So, in early 2016, Washington CAN initiated an immense organizing drive. First it went door to door and surveyed over 300 Seattle renters, more than 85 percent of whom identified move-in fees as the major barrier to finding new housing in the city. The group then used this information to rally its members and recruit new people to the cause. It held tenants’ rights trainings around the city. It convened press conferences. It built a coalition of supporters that included the local teacher’s union and domestic violence survivors, as well as some sympathetic property owners. Maykovich, who helped lead the campaign, says canvassing was a particularly crucial component. In July 2016, Councilmember Sawant, one of the movement’s key supporters in City Hall, formally introduced the move-in fee ordinance. It faced immediate and intense hostility from landlords, including the powerful 5,000-member Rental Housing Association of Washington, or RHAWA. The group argued that, by limiting deposits and fees, the new ordinance would subject landlords to additional financial risk and encourage them to make it harder for people to qualify for their rental units in the first place. The association also claimed that the ordinance would force some small and independent property owners out of the rental market altogether. Over the course of 2016, the RHAWA paid more than $50,000 to try to influence the council, making the group one of the city’s top-spending local lobbying organizations that year. Former lobbyist Martin “Jamie” Durkan Jr., who retired in 2017 after three years of working with the RHAWA, pegged the landlord’s ultimate loss on the power of Sawant and the grassroots “army” that supports her. “Even some of the most sane and rational councilmembers drift left because they are afraid of Sawant,” said Durkan, in a March interview with Outside City Hall, a local column that covers municipal affairs in Seattle. Sawant, for her part, says the move-in fee victory is not about some army enforcing her demands. It’s about movement building. The movement’s ultimate prize is to overturn Washington State’s decades-old ban on rent control. Indeed, as the Seattle City Council considered Sawant’s ordinance, Washington CAN kept up relentless pressure. It held rallies. It wrote op-eds. It sent a letter to the council signed by 26 different civic groups and labor unions. And it packed multiple public hearings on the matter. That’s how Michelle Dillon first got involved. She learned about the hearings from a notification on Facebook and decided to attend and offer testimony. Ultimately, the tenants’ movement got its way. On December 12, 2016, the City Council passed the move-in-fee ordinance in an 8-0 vote. Thanks to the grassroots fight, the combined cost of security deposits and move-in fees in Seattle can now no longer exceed the total value of the first month’s rent, and tenants can pay in increments, rather than all at once. Success, meanwhile, has only emboldened the movement. 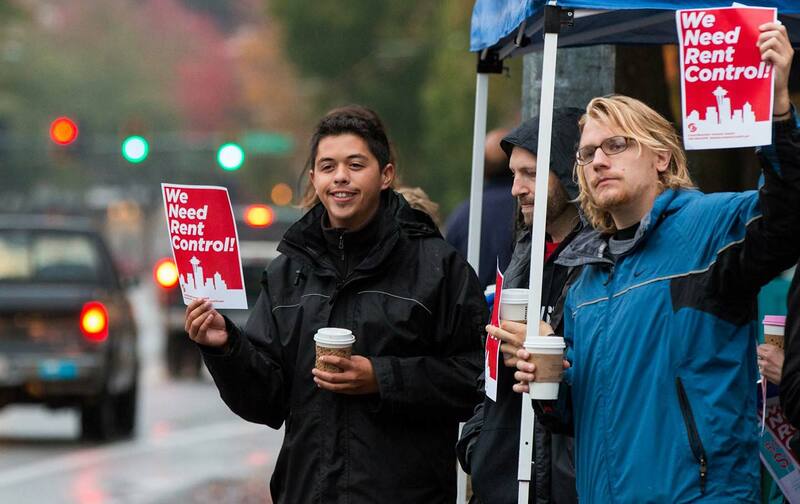 Washington CAN, for instance, is currently working to recruit renters and take its tenants’ rights fight to other cities in the region, including Federal Way and Kent in southern King County. In the months ahead it also hopes to push Seattle to strengthen its rental inspection law, which requires that all registered rental properties in the city be scrutinized every 10 years. And in March the City Council established a 15-person renters’ commission that will advise it on the policy priorities of local tenants. It is the first commission of its sort in Seattle—and, very possibly, the country—and speaks yet again to the rising power of housing-justice activists there. The movement’s ultimate prize, though, is to overturn Washington State’s decades-old ban on rent control. In order to obtain that ambitious objective, which will require victories in both houses of Washington’s narrowly divided legislature, the movement will have to make its presence felt in cities all across the state. It will have to repeat its local successes on a much larger scale. Update: On Tuesday May 30, the Rental Housing Association of Washington announced during a press conference that it is suing the city of Seattle in state court to overturn the hard-won move-in fee reform ordinance it passed late last year. The lawsuit, if successful, would invalidate the city’s effort to regulate the sort of upfront fees and deposits that can make it nearly impossible for low-income and working-class tenants to find new and affordable housing in the city.